It was another amazing tour! Everyone got along well and had talked many many different subjects regarding our lives and all through the tour. I am sorry that I was not able to update the post as the tour goes by. I had technical difficulties in Japan. Then I needed some time to recover from the tour and spending time with my family in Japan. Now finally I would like to share some highlights of the tour. 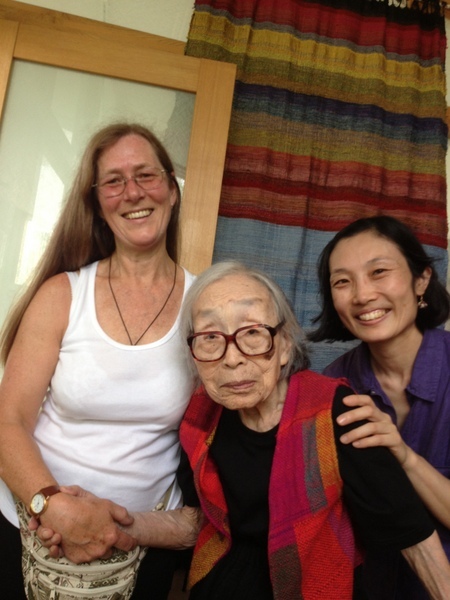 The highlight number 1 for me was definitely seeing 100 years-old Misao Jo at SAORInomori studio. She looked much smaller than I saw her 2 years ago. She didn’t talk much however I was so touched when she said “Beautiful.” to my SAORI top. And another time she said “Hanayaka (means colorful)” to my bag’s handles. That made me think she was still alert and was looking and observing even though she didn’t speak much. Kenzo was there to hear these her words so it was not my illusion. We had a dinner together at a Sushi restaurant ( a place where plates with sushi were rotating around tables and you can pick them up whenever you saw something you liked.). I saw her managed her chopsticks to feed herself. I was so impressed. One of the highlights was making new friends. 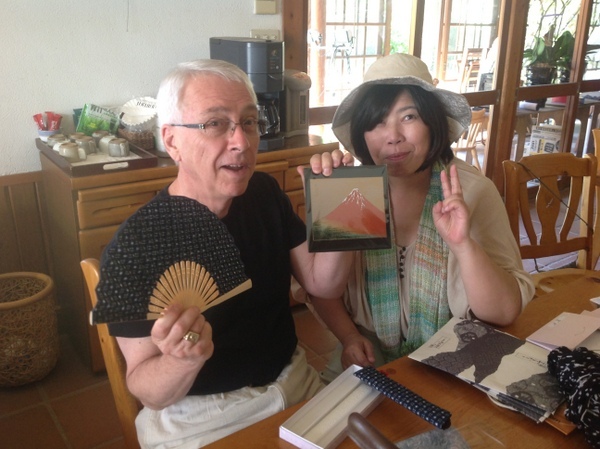 We had met Kumiko from Kurume city in Fukuoka prefecture at SAORInomori guest house. We had shared the house one night and had dye workshop together. It was her first time to come to Osaka and visit SAORInomori. She showed us her wonderful woven clothing and told us her new projects which was involving in her local community with SAORI. She said she had just started taking English conversation class. She was trying to speak to the tour members in English while Ralph used his audio translation program with his iPad. They had communicated somehow and it was funny to watch them doing it because they often misunderstood and took a long time to untangle the conversation. 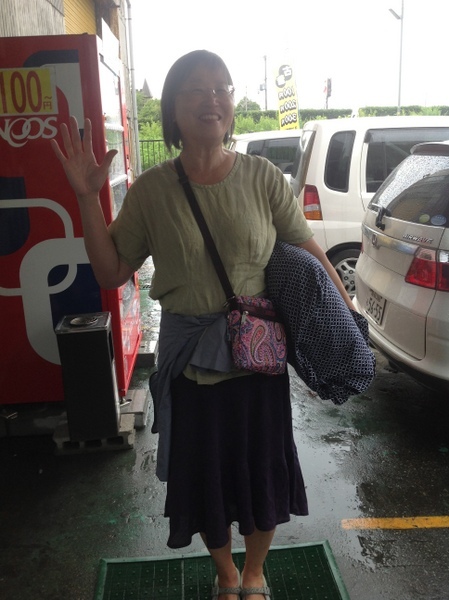 Several days later while we were staying at Flora House in Oita, Kumiko had visited us there. She brought many gifts from her city’s specialties which Kurume gasuri (ikat dyed woven materials). Then few days later when we left Flora House heading to Hiroshima we decided to get off the train to visit Kurume city where Kumiko lives. There was a small museum about Kurume gasuri. There were only 2 hours to spend in the city but it was worth doing that. We got a chance to see a lady weaving on the special loom with ikat dyed yarn, got to see a video explaining the history and got time to shop in the gallery! 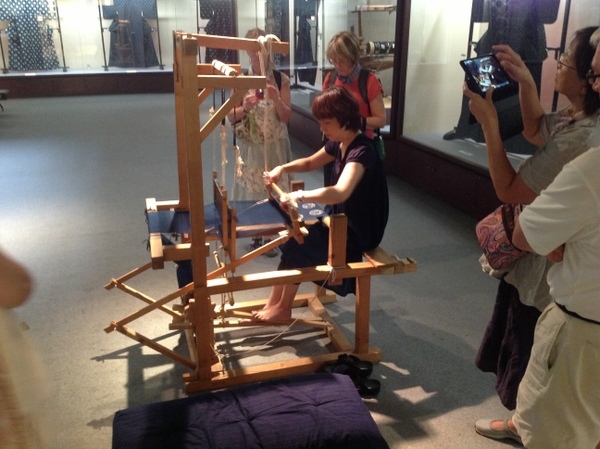 The history was very interesting because it was started by a 12 years-old girl who was a good weaver in 18th century. She had met a n inventor who created a better loom for her later. We learned a lot there about so many stages of the process of this amazing handcraft. 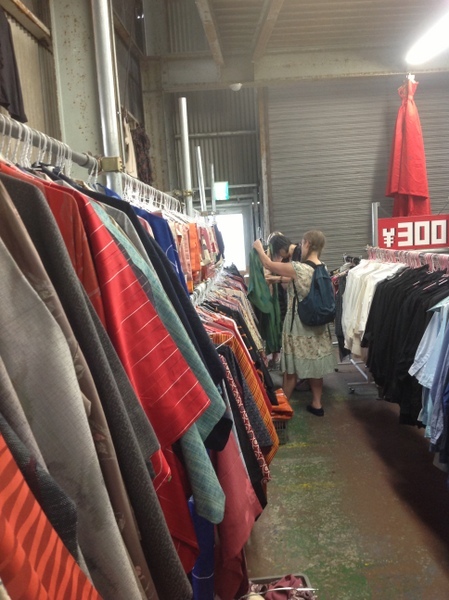 Another highlight was shopping vintage kimono at a local recycling shop in Takasago. 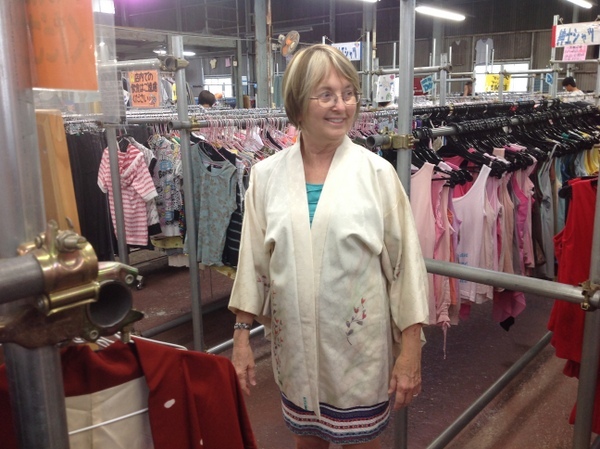 They sell kimono for amazing price like a t-shirt price at good-will in USA. Because it was not specialized kimono shop they sold kimono as an item just like other clothing there. You would not know how much they would have kimono at a moment. We were so lucky to have variety of choices. All we had to think was how much spaces we had in our suit cases. The tour was a big success! I am so grateful for such wonderful members who have enthusiasms and flexibility. However, next time I might do it in a different season though. We had a heat wave and it was awfully hot.